It’s easy to think of your traditional public branch exchange (PBX) as an old, reliable friend who has been with you since the stone ages. However, due to skyrocketing maintenance costs and its inability to grow along with your company, the time has come to replace your PBX with something new, something innovative: a cloud phone system. While PBX systems already hold a number of advantages, VoIP-based systems offer far more options and scalability benefits. In this guide you can read how VoIP fares when it comes to quality, reliability and security, while we also assist you in taking the necessary steps to make the move to the cloud. With VoIP solutions getting better with each passing year, analog PBX is getting more obsolete. However, it is still capable of things VoIP isn’t. Such a thing is that it is based on analog technology, which is considered to be the most reliable. Furthermore, your phones get power via telephone cables thus a system crash affects your business less than in the case of VoIP, which is immediately out of service should the power fail. And last, but not least, your PBX is configured to satisfy your business’ needs only and is physically located at your premises. But this is also a huge disadvantage. 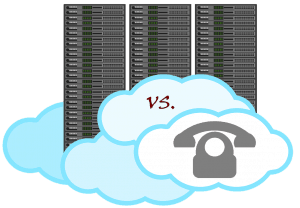 Traditional PBXs are hard to maintain not just because it costs a fortune and physically occupies useful space, but also because it is less scalable than a VoIP system. Furthermore, cloud phone systems provide tons of enterprise-grade features for very cost-friendly prices while they are capable of not just handling calls, but also video conferencing, business texting and even faxing through a simple internet connection. Speaking of the internet, every device connected thereto can be part of your virtual phone system: computers can serve as your system managers or softphones, while mobile phones can be turned into portable desk phones. As for your old devices, you have the option to replace them with VoIP-compatible ones, or you can keep them by installing analog adapters (ATAs). In fact, you can connect your entire traditional PBX to the internet by using said adapters, creating the ultimate hybrid system. Despite being the more logical solution, VoIP is still inferior compared to traditional PBXs regarding voice quality. Aside from unforeseen circumstances, voice quality in PBXs is crystal clear, which can only be maintained in VoIP by having a high-speed internet connection. However, it still won’t protect you from lagging, freeze-ups and voice distortions, because VoIP uses the UDP protocol in order to be separated from regular internet traffic as much as possible while keeping information exchanges uninterrupted. Another issue with VoIP is reliability and security. 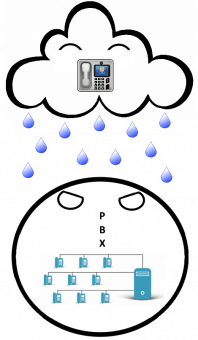 PBXs only go down if the hardware malfunctions or phone lines are damaged. As for VoIP, if your power goes down, your virtual phone system becomes inaccessible as well – unless you have a separate source to power it. Furthermore, a cloud system is vulnerable to hacking if you don’t take the similar precautions you would normally do when connecting any device to the internet. The simplest way of switching to VoIP is to keep your old PBX with an adapter. This way you don’t have to replace anything and you can unite the advantages of VoIP and an analog system, but unfortunately at the cost of scalability and easy maintenance. A better solution is to get rid of the PBX and keep the old desktop phones/fax machines (with ATAs) or to go in the cloud completely with VoIP-compatible devices. The latter option requires the configuration of all devices, which is fortunately done within a short period of time. Another thing to keep in mind is number portability: since getting your new cloud phone system ready requires some time (usually 1–3 weeks) you mustn’t cancel your old contract until the new system is set up. To avoid confusion, you can direct calls and faxes to the temporary number you get from the VoIP company. Office Application SoftwareVoIP vs PBXIt’s easy to think of your traditional public branch exchange (PBX) as an old, reliable friend who has been with you since the stone ages.